Mr. Shoaib Sultan Khan, the Chairman of SRSO, holds a Master’s Degree in English from Lucknow University, Bachelor of Law from Peshawar University and a Public Administration Course from Cambridge University, UK. Mr. Khan has been closely associated with policy making and development planning in Pakistan and is currently serving as honorary Chairman, Board of Directors of the Rural Support Programmes Network (RSPN), National Rural Support Programme (NRSP) and Director of Ghazi Brotha Development Organization (GBTI), the Aga Khan Rural Support Programme (AKRSP), Sarhad Rural Support Programme (SRSP), and Balochistan Rural Support Programme (BRSP). As Senior Advisor, South Asia Poverty Alleviation Programme (SAPAP) of the UNDP. During 1953-1978, Mr. Khan pursued a career as Lecturer and since 1955 as a member of the Civil Service of Pakistan wherein he served as a field officer in the then East Pakistan (now Bangladesh), as Deputy Commissioner Kohat and Peshawar, as Deputy Director of the Civil Service Academy, as Commissioner Karachi, as Secretary to Frontier Government in Departments of Health, Education and Social Welfare and as Director of the Pakistan Academy for Rural Development. Mr. Khan’s career in rural development dates back to 1959 when he came in contact with Dr. Akhter Hameed Khan. 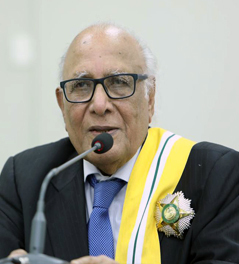 On the pattern of Comilla Project, he established the Daudzai Pilot Project of the Integrated Rural Development Programme in Pakistan in 1972. In 1978, he went to Nagoya Japan as a consultant to the United Nations Centre for Regional Development and from Feb. 1979 to end 1982, he worked in Sri Lanka as the UNICEF consultant on the Mahaweli Ganga Development Project. His work in Sri Lanka received a full one-page description in the Newsweek in 1981 under the title “A Man Named Khan”. After leaving AKRSP in 1994, Mr. Khan rejoined United Nations as Senior Adviser to UNDP till 2003. In December 1982, Shoaib Sultan Khan initiated the Aga Khan Rural Support Programme (AKRSP) making a difference to the livelihood of a million people in the Northern Areas and Chitral (NAC) district of Pakistan. The World Bank carried out two evaluations of AKRSP during 12 years of Mr. Khan’s helmsmanship of AKRSP and concluded that in a span of ten years the income of the NAC households in real terms had more than doubled. Mr. Khan set up demonstration pilots in the six countries of the SAARC region, on the pattern of the AKRSP. In India, it has been the basis of National Rural Livelihoods Mission (NRLM) as part of 12th Five Year Plan, aiming to reach 70 million households. In Andhra Pradesh, the UNDP’s demonstration pilot resulted in organizing 11 million rural women. In recognition of his work at AKRSP, Mr. Khan was awarded the United Nations Environment Programme Global 500 Award in 1989, Sitara-e-Imtiaz by the President of Pakistan in 1990; the Magsaysay Award by the President of Philippines in 1992, the World Conservation Medal by the Duke of Edinburgh in 1994, the Rotary International (Pakistan) awarded Man of the Year 2005 Gold Medal in 2006, Sitara-i-Eisaar for earthquake work and Hilal-i-Imtiaz on Pakistan Day in 2006 by the President of Pakistan. On 23 March 2019 ,The President of Pakistan conferred the Nishan-i-Imtiaz in recognition of his outstanding and selfless Public services in Pakistan and abroad. At the behest of United Nations Development Programme (UNDP), Mr. Khan as Senior Adviser, South Asia Poverty Alleviation Programme (SAPAP) undertook between August 1994 and March 2005 setting up of demonstration pilots on the pattern of AKRSP in Bangladesh, India, Maldives, Nepal and Sri Lanka and replication of AKRSP in Pakistan. In India, influenced by SAPAP, Society for Elimination of Rural Poverty (SERP), The Rajiv Gandhi MahilaVikasPariyojana (RGMVP) and National Rural Livelihoods Mission (NRLM), are now working with over 15 million poor rural households comprising nearly 75 million population. Mr. Khan is a frequent visitor to India’s SERP, RGMVP and NRLM. NRLM is now part of India’s 12th Five Year Plan aiming to mobilise 70 million rural households comprising 350 million people during 2012-2017. Mr. Khan on invitation of the World Bank and the Universities of Harvard, Princeton, Cornell, Berkeley, Los Angeles, John Hopkins, Calgary, London School of Economics, Nagoya University, etc., has given presentations and lectures worldwide on the rural development experiment in northern Pakistan. In 1993, on the invitation of the Graduate School for International Development of the Nagoya University, Japan, Mr. Khan spent three months as a visiting Professor at the Graduate School. Mr. Khan also served as Member, Steering Committee Sweden-based Global Water Partnership, Director of the Nepal-based International Centre for Integrated Mountain Development (ICIMOD), Member of the Advisory Group of the World Bank sponsored Community Development Carbon Fund, Member of the Government of Pakistan Advisory Committee on Millennium Development Goals and Chairman of the Pakistan Government’s Vision 2030 Group on Just Society and as Honorary Adviser to Planning Commission and Chairman of the Special Committee on Poverty Reduction, Social Protection and Women Empowerment, set up by the Planning Commission. .